The summer solstice marks days with the longest daylight and shortest nights, but it also marks when this starts to reverse and the daylight wanes (decreases). This solstice is celebrated by many traditions and in many places- basically as the celebration of plenty at the height of summer. This year the northern hemisphere’s summer solstice occurs at 12:39 EDT- on June 21, 2015 (to find this in your time zone use this converter). The name for the festival of the Summer Solstice in Druidry is Alban Hefin, which means ‘The Light of the Shore’ or ‘The Light of Summer’. When called ‘The Light of the Shore’ this reminds us that the seashore is where the three realms of Earth, Sea and Sky meet, and is respected and revered as a liminal (or ‘between’) place. 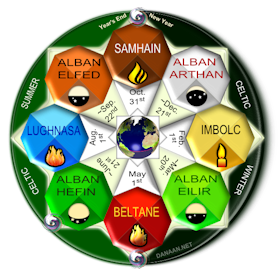 Many folk rituals at the time of Alban Hefin include both water and fire. The solstices (like the equinoxes) were significant in ancient times, and were marked by stone monuments. In England the megalithic stone complex of Stonehenge was built approximately 5,000 years ago. At the morning of the Summer Solstice the sun is aligned with and rises over the ‘hele stone’. This has become a popular event, attended by modern Druid orders and the public at large. The Callanish Stone Circle is another Neolithic site that is located on the Island of Lewis in the UK. It is part of a 20-site complex built 4,600 to 5,000 years ago, and has alignments to the solstices and equinoxes. The Ring of Brodgar stone circle on Orkney in the UK, was known for centuries by local people as the Temple of the Sun, and is aligned to the midsummer sunrise. Half a world away, the ancient Maya city of Holtun (or Head of Stone) buried in the Guatemalan jungle once had a seven-story-tall pyramid, an astronomical observatory, and other structures. 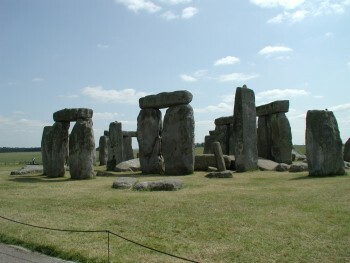 It was designed so that during the solstices the sun can be seen rising in line with the eastern structure. The Summer Solstice is also called Midsummer, and along with Samhain and Beltane Eve, Midsummer Eve is the second spirit night of the year. This time marks a thinning of the veil between worlds and when the Fae (fairies) are at their most powerful and are out and about; a theme famously used in the plot of Shakespeare’s play A Midsummers Night Dream. Regardless, this story has informed romantic ideas about the era- famously in the 1973 musical thriller the Wicker Man where this imagery is used in the film for a fictional Beltane sacrifice. Wicker men are now set ablaze during some Neopagan festivals, commonly at mid-summer and without any living sacrifices inside. The summer solstice is also known as Litha or Midsummer in some modern Pagan traditions. For these traditions, this is a time at which there is a battle between light and dark nature gods or ‘kings’, which reflects the yearly waxing and waning sunlight cycle. The Oak King is seen as the ruler of the year during the time of increasing daylight from the winter solstice to summer solstice, and the Holly King during the time of decreasing daylight from summer to winter. At each solstice they battle for power on the days when sunlight changes. The Summer Solstice is also known as Midsummer or St. John’s Day (celebrating his nativity), and is traditionally celebrated by bonfires on this night. Summer fairs are also common throughout Europe. Many celebrations retain aspects of the earlier Pagan beliefs. Traditional Midsummer bonfires are still lit on high hills in Cornwall, where in some towns chains of dancers spiral though the streets. Midsummer festivals are also celebrated throughout Scotland. In recent years on the Summer Solstice, the public has gone to Stonehenge for Summer Solstice celebrations. In Galicia St. John’s Day traditions include collecting medicinal plants (like fern, rue, rosemary, St. John’s Wort, Mallows, foxglove, and elder flowers). These can be hung in doorways, or they are dipped in a vessel with water and left outside on St. John’s Eve exposed to the dew overnight until the following morning, when people use the resulting flower water to wash their faces. This is most effective if the water from 7 different springs is used. In Latvia, the Midsummer/St John’s Day celebrations include bonfires burned all night- with people jumping over them, wearing wreaths of flowers (for women) and oak leaves (for men). In modern times, small oak branches with leaves are attached to the cars in Latvia during the festivity. In the version of the Ogham tree alphabet calendar popularized by Liz & Colin Murray (1988), the eigth lunar ‘month’ of the year is in June. This period ushers in Alban Hefin, when daylight is longest for the year. The Ogham tree associated with this month is the holly, or the Ogham letter Tinne. It can represent protection from the other-worlds, growth, and rebirth. Holly trees were traditionally known for protection from lightning strikes, and were planted near houses. Similarly to oaks, holly was also associated with thunder gods such as Thor and Taranis. We now know that the spines on the holly leaves can act as miniature lightning conductors, thereby protecting the tree and other nearby objects. A remembrance of the 2004 Summer Solstice Festival at the Hill of Tara in Ireland. This festival was an international event held in a beautiful and sacred place. Click here to learn more. Gather St. John’s Wort — St John’s Wort is traditionally gathered on this day, so that it is fully embued with the power of the sun. Thought to bring peace and prosperity, it was cast into midsummer bonfires, and placed over the doors of houses and farm buildings for protection. Gather and use Herbs and Flowers — Other special flowers (like stonecrop, vervain, and yarrow) can also be gathered on this day and hung in special places about the house. It is a good time to harvest many sacred and healing herbs. 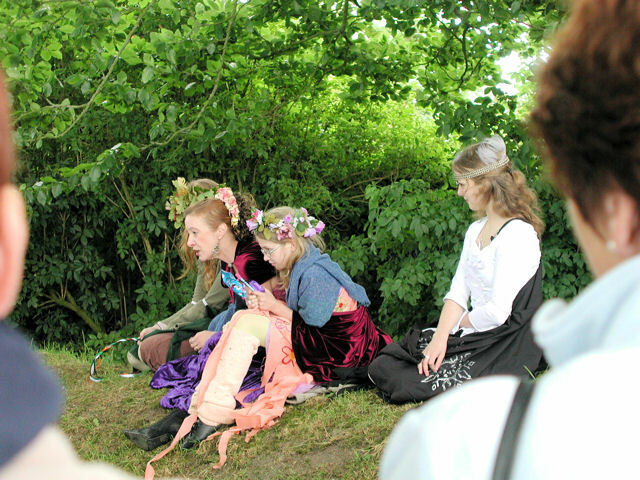 Dress the Well – Leave offerings of flowers and garlands (ribbons are good too) for the water fairies at wells, springs, and streams on Midsummer. Offerings of coins or the like can also be tossed into the water. Have a ‘Bonfire’ – while a large communal bonfile (or two to run between) is a tradition, any small fire can also represent this time of the sun’s strength. Wear Wreaths & Flowers – wear flowers or leaves to celebrate the bounty of the sun. Callanais (Callanish) Stone Circle. (n.d.) Retrieved from Mysterious Britain and Ireland website. Deeper into Alban Hefin. (n.d.). Retrieved from the Order of Bards Ovates and Druids website. Elder Mother (2014) in Wikipedia. Freeman, M. (2001). Kindling the Celtic Spirit: Ancient Traditions to Illumine Your Life Through the Seasons, San Francisco: Harper Collins. Lost City Revealed Under Centuries of Jungle Growth. (April 26, 2011.) Retrieved from the National Geographic website. 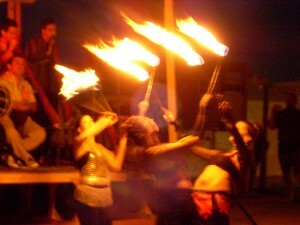 Mid-Summer Eve: Second Faerie Festival of the Year. (March 18, 2011.) Retrieved from The Dream Faire website. Mythology and Folklore of the Holly. (n.d.) Retrieved from the website Trees for Life. Order of Bards, Ovates & Druids. (2001). Alban Hefin Ceremony of the Order of Bards Ovates & Druids. East Sussex: Author. Tree Lore: Hazel (n.d.) Retrieved from the Order of Bards, Ovates, and Druids website. Tree Lore: Oak (n.d.) Retrieved from the Order of Bards, Ovates, and Druids website. This Summer Solstice page was originally published on 4-24-2013, with many revisions since then.